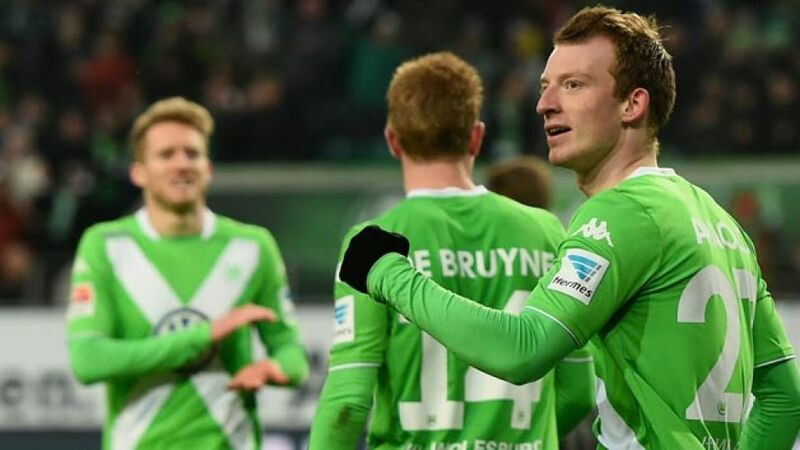 Wolfsburg - VfL Wolfsburg may have posted their 11th home victory in the Bundesliga this season with a 3-0 win over SC Freiburg on Sunday, but the Wolves were not entirely satisfied with their performance. Maximilian Arnold: "It's all well and good having lots of shots on goal, but if you don't score any of them then they're no use to you. That's why it was good that we were able to grab our second goal after the break with the penalty. That pretty much killed the game off and from then on we just controlled things until the final whistle." Ricardo Rodriguez: "It wasn't an easy game but we scored our first goal early on and that was very important. We struggled a bit in the second half and failed to convert a lot of chances. That makes things more difficult, but we deserved to win in the end." Daniel Caligiuri: "The most important thing we did was to get our focus back on the Bundesliga after playing in Europe during the week. I think the 3-0 scoreline is completely deserved. We could definitely have scored a second goal earlier than we did so we have to try to kill games off earlier." Diego Benaglio: "It was an evenly-balanced game at the start and we took a while to get into our stride. Roman [Bürki] saved our chances well, so we had to be patient but after we made it 2-0 we were pretty safe." Timm Klose: "I'm delighted we kept a clean sheet. It's been a long time since Robin [Knoche] and I last played a competitive match together - and we won that one too! We have to stay focused now because if you don't then it can become dangerous. You only need to look at the example of FC Bayern München last season when they stopped playing as well after they'd won the league. We need to take heed of that and make sure it doesn't happen to us. We simply have to keep working hard. I'm really looking forward to playing against Inter Milan and it's going to be a great game." Sascha Riether: "It's always a shame to be left empty-handed when you play pretty well. We knew that Wolfsburg are a good attacking side and that we wouldn't be able to stop them creating chances altogether, but we lacked a cutting edge up front ourselves. We had a few half-chances but nothing clear-cut, so maybe we need to work on carving out more opportunities in attack." Oliver Sorg: "In terms of tactics, we were able to implement our plan quite well but we conceded the first goal through a silly individual mistake. That can happen, but of course it makes life harder for you and maybe the nerves creep back in a bit. When that happens then you're not as calm in the final third and perhaps that was our problem today. We simply have to try to stop making mistakes, but you have to say that Wolfsburg also played well today. You get self-confidence by winning games and earning points and that's what we need to do."